The Chinese men are leading 14.5 – 10.5 after completion of the Classical stage. 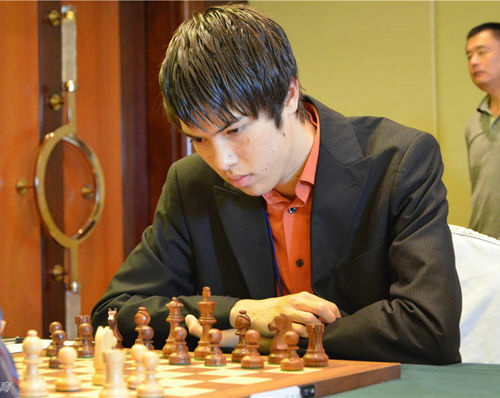 First seed Wang Yue is having a great tournament, obtaining 4.5/5 points and getting a rating performance of 2879 points. In the women’s section, the Chinese team is even more dominating, although this is no surprise given the rating differences between both teams. The score after the Classical stage is 16.5 – 8.5. Ju Wenjun was the leader of China with 4/5 and a rating performance of 2486 points. The rapid section of the event is a double round-robin (10 rounds) with the Schveningen system. The time control will be 25 minutes with 10 seconds increments per move. This section will run on 25th-27th July. China men: GM Wang Yue 2705; GM Zhou Weiqi 2616; GM Wen Yang 2593; GM Xiu Deshun 2556; GM Lu Shanglei 2536. China women: WGM Ju Wenjun 2531; WGM Tan Zhongyi 2478; WGM Guo Qi 2443; WGM Ding Yixin 2432; WGM Wang Jue 2399. USA women: WGM Tatev Abrahamyan 2316, WGM Sabina-Francesca Foisor 2281, C Iryna Zenyuk 2250, F Alisa Melekhina 2216, WM Viktorija Ni 2173.